Midlands music stories from Robin Valk. With a side of Radio. Birmingham has a School of Music. I've had dealings with them down the years, from when the old BRMB ran classical shows - really, they did - and I presented. That was all some thirty years ago, when the place was resolutely classical. I always felt like a hooligan scruff around them, probably because I was a vulgar commercial radio person trespassing in the groves of academe. Things change. I don't know who leaves the Birmingham Conservatoire to build a classical career these days - and by the way, I'd love to know who does - but I'm constantly delighted and impressed by the range of musicianship the place has spun out into the local scene. I love the folk stuff encouraged by Joe Broughton; a mighty eight Conservatoire graduates have graced the Destroyers. There are many others, of course; I haven't even touched on the jazz guys. A common factor is a sense of adventure, a willingness to up-end apple carts, and blazing musicianship. Erica Nockalls is part of this: a terrific fiddle player with a brand new solo album. She tells a story of musicianship, multiple bands, attitude and application. While I can think of lots of musicians who have left the Conservatoire to make careers for themselves, you’re one of the few to make something of it on your bio. Is that significant? I went to the Conservatoire to achieve two things - to learn how to play the violin to the best of my abilities, and to meet like-minded musicians with the sole intention of forming a rock band. By the end of my time there, I was able to tick off both items. I didn't graduate as a concert violinist or an opera singer by any stretch, but I never wanted to be either. I got out exactly what I needed. I'm proud to say that I attended and graduated from the Conservatoire. I stayed with the same fantastic virtuosic violinist Ken Aiso as my teacher for the entire four years of my degree course. Many didn't. Quite a few of dropped out, which annoyed me greatly - I had a hard time understanding why a musician would find themselves in such a specialist place and decide it wasn't for them when they got there - and realised they had to actually do some practise. There were 15 violinists in the first year; 4 in my final year. It was competitive, sure, but not in the way most would think; it seemed like you had to compete with yourself to be the best you could. I didn't have a problem with that. Fascinating. I've only seen the recent folk and experimental sides of the Conservatoire, and I've always been impressed wlth that. I hear that the Conservatoire is a little more musically diverse than it was when I attended, but back then I felt like (and was, to put it bluntly) musically and stylistically an outcast. A bizarre situation to find yourself in - surrounded by musicians yet nobody wanted to play, least not with me, anyway! So - what did you do? I hung out at rock pubs/clubs and got myself into the Birmingham rock and metal scene. That led to the initial line up of Fireswitch; my first prog metal band, where I shared lead vocals and played electric violins through a myriad of guitar fx. I used to go busking in Stratford-Upon-Avon with my then boyfriend and Fireswitch guitarist. I got the gig with The Wonder Stuff when the Stuffies' producer walked past Shakespeare's house in Stratford and spotted me on the violin. And what did we use for busking material? Well, often after Joe Broughton's folk classes at the Conservatoire, I'd take the folk music I'd Iearned that day home to my Bearwood flat and arrange it for fiddle and guitar. I enjoyed playing and learning about folk with Joe Broughton enormously. He taught me a whole different angle to playing the violin. I liked him because he was a product of the Conservatoire himself. He showed me an alternative route with my instrument... not to mention being a bit good on his fiddle. The whole folk thing wasn't really cool then, but it set me on a path. So you were part of the Wonderstuff while still studying at the Conservatoire? I was in my second year at the Conservatoire when I joined The Wonder Stuff and I've not had a proper job since. I remember having to plead for time off orchestra rehearsals to play at a Wonder Stuff album launch in the old Birmingham HMV in 2005. Wonder Stuff fans were queueing around the block by the time I got there. And I knew I was on the right path. I don't know if it was just my imagination, but I did get the feeling that I was being frowned upon for being in a rock band. No one else seemed to get quite why I loved going around the country on a tour bus, larking around on stage (and everything else that comes with being in a band like The Wonder Stuff), but it was important to me to pursue this, much more so that sitting in a orchestra watching the clock. There's session work too. Again, you’re one of the very few people to make mention of this sort of work – which, by the way, I view with great respect, having had long chats about this with a cellist pal who did a lot of this work in London. How does the work come to you? Can you pick and choose? It is people you know? I've never really felt like a true session musician. I like to play with as many people as possible and any session work I get almost always comes through musician friends. So, because it comes from people I know and respect, it's generally going to be music I like, worthy of time and care. It’s a fair stretch from the Proclaimers to The Wonder Stuff… but an even longer stretch to your new material. What pushed you in your current direction? Nothing pushed me, it was simply a matter of timing. It took me until I was 27 to feel I was ready to write my solo album, and as the mission statement explains in the 'Imminent Room' artwork, I was bored of hearing and being disappointed by the efforts of almost everybody else, so I thought I'd invent my own music and stop moaning about it. It's not like I'm a good little classically trained violinist turned bad - I've always been like this, it's just now it's coming out. And how long did the album take to do, and where did you do it? A major deal or an indie, or your own label? The site mentions the album launch, but not where and when. 18 months. When I first started, I thought I'd have it nailed and out within a year... what a fool. The first year I just chipped away at the writing and recording in my own time, gently letting it all drip out. I recorded most of the album as I went, rather than demoing the whole thing then doing it properly at a later date. Imminent Room was recorded at the Shropshire home where myself and Miles Hunt from The Wonder Stuff live. We have a simple studio set up, some decent mics, a good computer and a well-stocked fridge. I didn't spend a penny on this album until it came to mastering, though I did rely enormously on my wonderful friend George Taylor for mixing the record, and I thank him for doing such a brilliant job. I also thank Miles Hunt for his patience every time I needed to ask a technical question, or throw the computer out of the room, shouting and occasionally crying. I'm a generally very calm person, but the making of Imminent Room really took everything I had emotionally to complete it. It was testing - it turns out writing and recording your own album is incredibly stressful... but it was totally worth it and I'm happy with the outcome. I've already started the next one. I have painted a piece of artwork for every track on the album, news of an art installation launch will be coming very soon. You’re making a big extravagant very visual splash around the album. The videos use very strong imagery – who directed? Did you storyboard the material? Given your very visual stage presence, your logo, a very slick website, it’s clear how important that is. Any worries that the visuals overwhelm the material? Nope. I could go on stage in jeans and a t-shirt, but I'm not about to do that. It's all art and I'm just doing what feels right. It would be pretentious for me if I did sport a pair of crocs onstage, because that's not what I am. George Taylor directed (and mixed and co-produced, shot, and edited) both 'Cut Them Out' and 'Manikin'. We work well together and understand each other, and no idea is too outlandish for him.. It's a case of having a chat over a cuppa, or a visit to the pub, and figuring it all out. I'll have very definite ideas of how I want things to look and George cleverly makes it all happen. George also mixes and produces video for The Wonder Stuff too - all worth a look. They are very different to mine though! I plan on having videos for many more of the tracks. I can see you doing a huge extravagant very visual show given half the chance and big fat budget, but how will you use visuals while working up to that? I'm in two minds about that. I could day-dream and fall in love with blowing a huge budget on something fantastic and fabulous with dancers and fireworks, but then equally I could be happy with a few sparklers on stage and spend the cash on writing a new album... on a yacht, in the sun. Some of your stuff, like Cut Them Out, is pretty damn fine sharp pop, that could sit happily on daytime radio. Are you working that channel? If daytime radio is how people get to discover my music, then great. I'd be happy if I had initially heard an artist on the radio and then found that they were capable of more. There really isn't a clear genre to put my music into. I'm happy with that. Let’s talk about juggling priorities. You go out as a duo with your partner Miles Hunt, you’re a member of the Wonder Stuff, you play with the Proclaimers, and now you’ve launched a solo career. How do you reconcile all this? It's pretty straightforward. The Wonder Stuff and Proclaimers make bookings quite far in advance, making it easy for our agent to see where to route the Miles and Erica duo tours. I'd like to gig more in the future with my live band as that's proven to be a lot of fun these past few days on this tour! When you play fiddle, it’s got a huge huge impact… but sometimes you’re belting out dirty slide guitar. The violin’s a terrific rock instrument, but you now seem to be making a bit more spare use of it. Live, I usually have a violin in my hand. It's my main instrument and I can't ever see me straying too far away from it. I love my SG, but it very much play second fiddle. 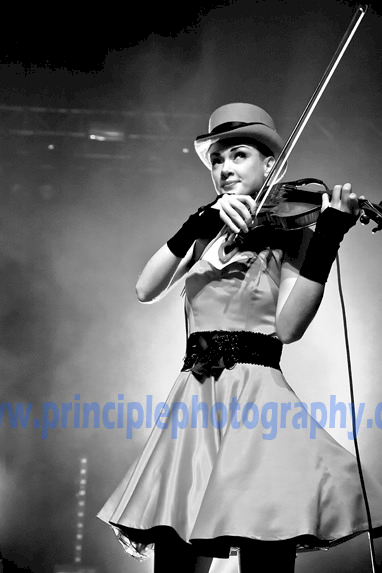 Erica, thanks... name me a few of your favourite fiddle players…? Nigel Kennedy - the inspiration behind why I picked up the violin in the first place; Fritz Kreisler - love his style and compositions, wonderful.... and Grazyna Bacewicz - an under rated, yet wonderfully cheeky, progressive, inventive and individual style of composing for violin. Imminent Room was released on Independent Records this month. The Erica Nockalls band toured supporting The Wonder Stuff throughout April to help the launch. Thanks to Ian Dunn of Principle Photography and the legendary Proclaimers Facebook fan base for steering me towards this post. Get the Radio To Go Newsletter to your in box every Monday. It's certainly an album that's hard to categorize. It is a lot more electronic than the organic experience I was expecting but no worse for it. Always good to see artists with this range of tastes and the ability to pull them together. Bravo! Many of the problems that students face making the transition from School to Uni/ Conservatoire to study music is that they have been taught by failed musicians up to that point. Once you have decided to do Music at degree level, you are fairly committed to a life involving performance of some sorts. That is the key difference from school. Another factor is that, if your mortgage depends on you performing and earning, then you have to be taught the skills to cope with the pressures of performance. Being the best in your school/ city/ region on a particular instrument isn't necessarily going to be enough. It's important kids are taught how to handle the pressures of performing well and consistently at school level. Here lies one of the many reasons why music can transcend so many facets of education. What's the difference between not handing in your Maths or Geography homework on time between not rehearsing and screwing up a concert performance? Deadlines are deadlines and instilling kids with respect for those pressures can only be positive as a life skill. Teaching music isn't just about note bashing, it's a complex balancing act which involves many skills that can be utilised in many aspects of daily life. It should be inspirational and aspirational and above all fun! You there, in the audience. Yes, you. Shut the f@ck up! Please put your email address in the body of your message!